Preliminary Seismic Data for American Lithium's North Playa FLV Project Shows Thickening of Potential Lithium Clay Stone Unit to the South - American Lithium Corp.
Vancouver, B.C., October 31, 2017 – American Lithium Corp. (TSXV: LI) (OTCQB: LIACF)(Frankfurt: 5LA1; WKN: A2AHEL) (“American Lithium” or the “Company”) reports is has received the initial data and interpretation from the Company’s seismic survey conducted in August and September, 2018. Initial interpretation indicates a general shallowing upward of sediments and unroofing of prospective Lithium clay stone layers in the west side of the north end of the Fish Lake Valley (FLV). The target Sediment package that hosts the neighboring Rhyolite Ridge Lithium deposit is interpreted to thicken a shallow up on the South end of the Seismic line. 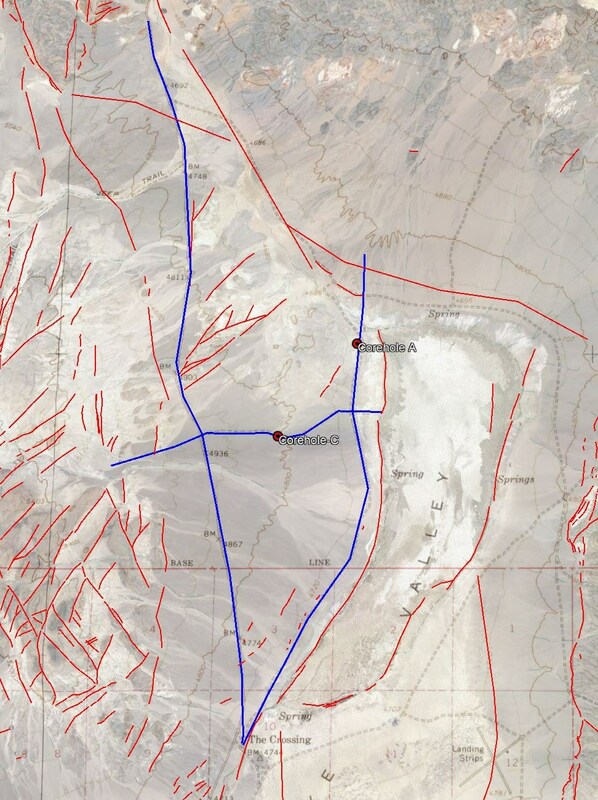 12 miles, (19km), of seismic line has been collected over two north-south lines with one east-west tie line. The survey was designed to integrate downhole data from two existing drill holes and integrate surface mapping to develop a regional picture of the lithium clay bearing sediment formation seen to the south in Global Geoscience’s Rhyolite Ridge Lithium Borax Project. American Lithium consultant Dr. John Oldow comments on the preliminary analysis, “The thickness of the FLV assemblage rocks increases significantly south of the northwest-trending faults that carry older units including the Rhyolite Ridge tuff to the surface. South of these faults the mudstone and sandstone thickens dramatically to over 700 feet. The valley’s prospectivity for lithium and boron is well known since mining began there in the 1880s. Surging lithium demand and rising prices, along with recent strategic metal status being declared by the US Government and breakthroughs in lithium processing methods, have intensified investment focus onto US domestic lithium production. Principal among the Fish Lake Valley lithium deposits under evaluation are lithium claystones, such as the Rhyolite Ridge project undertaken by Global Geosciences Corp., which adjoins the FLV Project, and is responsible for Global Geosciences’ $400 million market cap. The seismic survey was conducted by Bird Seismic of Globe Arizona utilizing a Seistronix EX-6 cable based 24 bit recording system and a United Service Alliance model AF-450 nitrogen gas accelerated weight drop source and a data receiver interval of 20″ (6m) and a source interval of 20″ (6m). American Lithium is actively engaged in the acquisition, exploration and development of lithium deposits within mining-friendly jurisdictions throughout the Americas. The Company is currently exploring and developing two projects, the FLV and TLC Projects, in the highly prospective Esmeralda Lithium District in Nevada. These projects, within 30 miles of each other, are close to infrastructure, 3.5 hours south of the Tesla Gigafactory, and in the same basinal environment as Ablemarle’s Silver Peak Lithium Mine, and the advancing deposits and resources including Global Geosciences Rhyolite Ridge and Cypress Development Corp’s Clayton Valley Project. For more information, please contact the Company at info@americanlithiumcorp.com or visit our website at www.americanlithiumcorp.com.